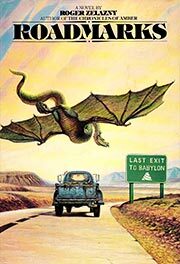 Zelazny, Roger Roadmarks . Ballantine/Del Rey 1981. Summary: On a strange road that reaches from past to future, a man fights assassins and attempts to prevent a Greek defeat at Marathon. Published: Ballantine/Del Rey 1979 (0345285301BUY), 1981 (0345253884), 1994 (0345345150). Translation: French by Alain Dorémieux as Repègres sur la route , Denoël 1981 (2207303241). Translation: Italian as Strada senza fine , Mondadori 1980, Associati 1994 (8878194913).